On Friday I sat down with Affinity Bridge CEO Mack Hardy at his company’s offices in the beautiful and historic Dominion Building in Vancouver. Mack volunteers as PeaceGeeks’ Chief Technology Geek and has spent over eleven years using technology to create a positive change in the world. His company, Affinity Bridge, focuses on software development for social and environmental change, and works with clients like Creative Commons, the Canadian Parks and Wilderness Society, as well as PeaceGeeks. I talked with Mack about Affinity Bridge’s involvement with PeaceGeeks, the Services Advisor platform, and much more. Q: How did you get started with PeaceGeeks? I was asked to help out with some of the projects by a friend who was already volunteering, got interested and became more and more involved. Can’t believe that was four years ago. A few years ago I would’ve said, ‘Oh yeah, tech can do it all.’ Now though, I really think that it’s about personal relationships. I think tech is just a bridge to the relationships between people. It’s a reminder to us all that everyone who’s tweeting, on Facebook, Whatsapp—they’re all just people trying to talk to their people. Q: What are the unique needs and challenges that you face developing software for non-profits? A: One of the biggest challenges designing or developing products for non-profits is that they have limited internal technical capabilities. So, we’ve been focusing on building open source stacks that are good for collaborating. Sometimes in a small business you might try to build something that’s your intellectual property, but instead, we’re trying to maximize impact and keep the whole platform open to collaboration. Services Advisor has huge amounts of volunteer writing in it, and a lot that was accomplished during a two-day hackathon is still being used in the core platform. Q: What are some PeaceGeeks projects that Affinity Bridge has worked on? A: The Amani platform, which was a PeaceGeeks platform we helped build out, was focused on developing a base website for tracking locations of incident reports—in Sudan, it was incidents of violence. We’ve had folks from other parts of the world take this Drupal open source CMS stuff we built and run with it—because it’s accessible and there’s a lot of good functionality in there. With Services Advisor, the UNHCR is already working on problems faced by refugees, so we’re trying to bring the technology up so it bridges information gaps in their programs. It’s not always that technology is the solution to real world problems, but you have to fit the solution to the problem set. Q: One issue Services Advisor is facing right now is making it scalable. In theory Services Advisor could be used for all 16 million UNHCR refugees and in humanitarian crises worldwide. Without getting too technical, if possible, what are the challenges to scalability? A: There’s a bunch of different challenges. One main technical challenge is building one platform that fits the needs of all the different instances it could be used in. Currently the way Services Advisor is structured is that there’s one set of software and we run a copy of it for every group. So with UNHCR Jordan, Somalia and Turkey, we’re replicating the code and running a copy of it. It’s very much like the prototype—but with an accessible back end for service providers. And now the roadmap will take us to where the app is like a cloud hosted app like Gmail or Google Maps, where you create an account and run the platform. One of the design challenges will be that not everyone wants the same flavour milkshake. Each situation is contextual and different—and will have different needs and requirements for the app. That’s some of the stuff we’ll figure out along the way, but we’re basically trying to solve the same kind of problem—access to valid information. We’ll put stuff on the map that’s vetted information from the provider of the program that says, 'Yes, this program happens on Wednesdays at 3 o’clock, we’re running it until March, and then it’s done.' Having reliable information is the ultimate goal. One of the benefits of the new Services Advisor is that the information is vetted by the people providing it. It also gives service providers the ability to find each other and make reliable referrals. Q: What do you see and hope for the future of Services Advisor? What do you see as its potential? What could the impact be if everything went right? A: We’re just at the beginning. I think we’re getting to the point where we can begin to see the real impact. On the roadmap for the future, if we scale the platform, we want to employ the double strategy of better technology and human coordination. Providing reliable information to people that need it, at scale, would be a great thing. I think some of the real impact remains to be seen, but the problem is so vast that there’s a ton of work that needs to be done, so it’s hard to measure. But, there’s so much need that anything that makes any impact is better than nothing. Q: Why should the private sector want to be engaged with non-profits like PeaceGeeks? If the private sector does want to be engaged with humanitarian organizations, what kind of help can the private sector offer? A: I think something that has worked really well for PeaceGeeks is partnering with tech companies like Affinity Bridge, Appnovation and Axiom Zen, to leverage their technical capabilities to help push PeaceGeeks’ tech forward. Hackathons where developers from these companies come in and help has been huge. It allows PeaceGeeks to develop a long term plan in collaboration with corporations—as opposed to the old model where a non-profit gets a grant, hires a bunch of people and then the project is over when the money runs out. PeaceGeeks keeps their core small and their leverage big. Other corporate partners for PeaceGeeks, like The Hive and Lush have been amazing supportive partners for a long time. Their power to amplify PeaceGeeks’ message is really important. Their support, financial and otherwise, covers home base for PeaceGeeks and allows them to do what they do. Corporate citizenship really reflects to values of the people running the companies. Customers care about that too. There’s such a benefit for companies to do business and be associated with non-profits like PeaceGeeks. The rise of B corporations shows how important it is to customers that the companies they support have social mandates. Q: Do you think there’s limit or ceiling to how tech companies can impact humanitarian causes and peacebuilding? Can tech do it all, do we not need governments, etc.? A: A few years ago I would’ve said, 'Oh yeah, tech can do it all.' Now though, I really think that it’s about personal relationships. I think tech is just a bridge to the relationships between people. It’s a reminder to us all that everyone who’s tweeting, on Facebook, Whatsapp—they’re all just people trying to talk to their people. We’ve got to have compassion for all people in the world. And certainly tech can contribute, raise money, help provide tools, but it’s not a solution. It’s just a delivery mechanism for the kind of response that needs to be made. Are you ready to partner with PeaceGeeks? PeaceGeeks is looking for grassroots organizations in developing and conflict- affected areas who are interested in using technology to protect human rights in their community. We believe that grassroots organizations understand these types of issues better than anyone else and we would like to help your organization create the right solutions to them. We therefore invite you to learn more about what PeaceGeeks does and how partnering with us can make a difference in the work that you do. Partnership applications are accepted on a rolling basis, but we have an upcoming project in-take, for project starting in October! If you are ready to get started, please submit your project by September 30, 2014! 1. Are a grassroots, non-profit organization based in a developing or conflict affected area. 2. Have a demonstrated track-record focused on the promotion of peace, human rights or accountability. 4. Have team resources able to commit to at least 5 hours per week to this project. 5. Experience using computers and the internet. 6. Can provide two references from independent organizations who can testify to your organization’s track record. 1. Are involved in partisan politics. 2. Have links to terrorist activities. 3. Engage in religious proselytizing or conversion activities. 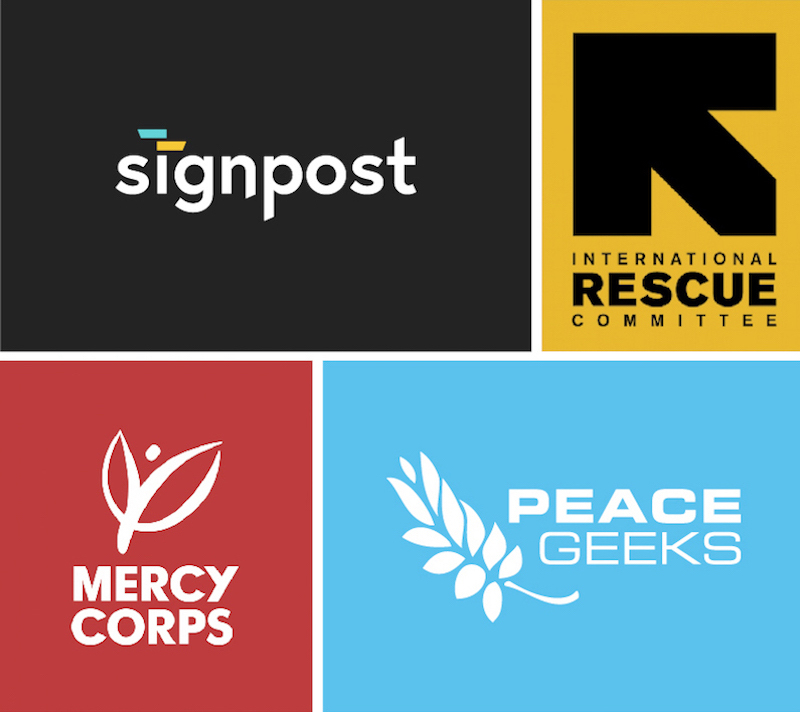 PeaceGeeks is a Canadian non-profit organization that builds technology partnerships with grassroots, non-profit organizations in developing and conflict-affected areas to transform their efforts to promote peace, human rights and accountability. Established in 2011, we have worked with groups in Uganda, Kenya, South Sudan, Burundi, Sierra Leone, Liberia, Egypt, Palestine, Nepal, Philippines and Indonesia who focus on a range issues including gender-based violence, engaging youth in peacebuilding and development, empowering women through self-sufficiency and building networks of women in leadership. We have an established team of over 200 volunteer professionals experienced in fields such as web and software development, graphic design, communications, marketing, project management, social media and online security. Please see our website for more details. Our Executive Director, Renee has been traveling. She is now a Fellow of the United Nations Alliance of Civilizations. The purpose of this fellowship programme is to enhance understanding between Muslim majority countries in the Arab community. A number of participants were chosen for this fellowship and had the opportunity to travel between three Muslim-majority countries in the Arab world, Europe and North America. Throughout the three weeks, participants connected with NGO's and government representatives in attempt to bridge the gap between the Muslim and Western world. Participation is based upon nomination and Renee was nominated based on her work with PeaceGeeks! Her efforts towards a more peaceful world are being recognized and shared with others. PeaceGeeks will be attending international conferences in November in Nairobi, Kenya. We will be sending our very own geek, Johanna Khisa who is a member of the PeaceGeeks Board of Directors. Johanna is a technology management consultant with over 15 years of international experience and is inspired by technology because of the possibilities it allows us to create. She will be bringing her passion in technology and peace by representing PeaceGeeks at the two events in Nairobi, Kenya. Johanna will be attending in Nairobi is the International Conference of Crisis Mappers in Nairobi and the annual summit hosted by Digital Humanitarian Network. PeaceGeeks has been invited to give a talk at the International Conference of Crisis Mappers. The conference is a leading humanitarian technology event of the year. It connects humanitarian, human rights, media organizations with top technology companies and software developers and academics. Many innovations and best practices in the developing field of Crisis Mapping have emerged from these conferences and this facilitates the advancements and partnerships in this field. This conference has had media coverage from some of the most prominent media outlets including the New York Times, Washington Post, The Economist, and CBC News. The theme for this year’s ICCM is “Humanitarian Technology Innovation In and Out of Africa”. Topics such as regional crisis mapping and early warning projects, grassroots, people centered mapping and development; communicating with disaster affected communities, crowdsourcing crisis information, social computing and information forensics will be explored. The second event that Johanna will be attending is an annual summit hosted by Digital Humanitarian Network. The Digital Humanitarian Network is a “network of networks” to form an association between Volunteer and Technical Communities and to provide a platform for formal, professional humanitarian organizations to interact. Participants in this conference will be examining current humanitarian challenges in relation to technology, digital response, crisis management, and ways in which we can create solutions to those challenges using adaptable, agile methods and tools. We look forward to Johanna's return so she can share her amazing experiences with us! The knowledge gained from these two events will definitely be an excellent resource for PeaceGeeks.